A couple of weeks ago, I went to visit my mother in her new house. She made me earn my al fresco lunch – trimming the grass, edging the lawn and visiting the garden centre to buy various veggie seeds for her four large raised beds (kindly left behind by previous resident). I also waded through several battered old cardboard boxes filled with my childhood books. Her new home has very little storage and my ‘treasures’ either need to be sent to charity or transported back on the train, with me, to London. The boxes comprised mainly books on nature and wildlife, Australian children’s stories which had belonged to my mother and then me, and lovely, very dog-eared, hardbacks of my three childhood favourites with my name scrawled in them in a childish hand – the Water Babies, The Secret Garden and Rapunzel. Rapunzel was and still is my favourite fairytale and is the source of two lifelong obsessions: castle towers with ‘slitty’ windows, and long, plaited, golden hair. As a youngster I yearned to live in a tower and have hair (and suntan) like the model in the Bergasol tanning adverts – a long, thick, blonde plait half way down my back. I’m still working on it! As I sat on the train back to London with my bagful of book treasures, I re-read Rapunzel then gazed out the window at the huge East Anglian skies and daydreamed about castles (and handsome princes). An image popped into my head of a castle surrounded by tulips and I remembered the wonderful BBC programme ‘Glorious Gardens from Above‘, in which Christine Walkden travelled the length and breadth of the UK in a hot air balloon, dropping into various notable gardens en route – beautiful gardens and superb drone photography. For me, one of the most magical, memorable locations she visited (and the image that popped into my head) was Arundel Castle. Filmed at tulip time. And it was currently tulip time. Bingo. Daydream to day trip. Arundel is just over an hour from Clapham Junction on the train and yet feels a world away. 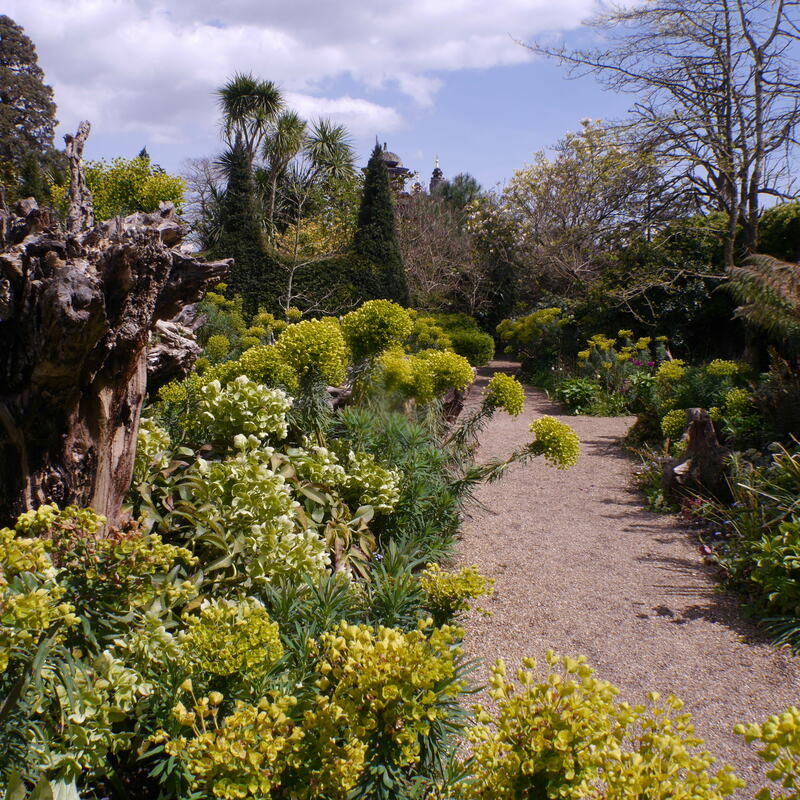 Walking around the various gardens truly is like stepping into a fairytale. 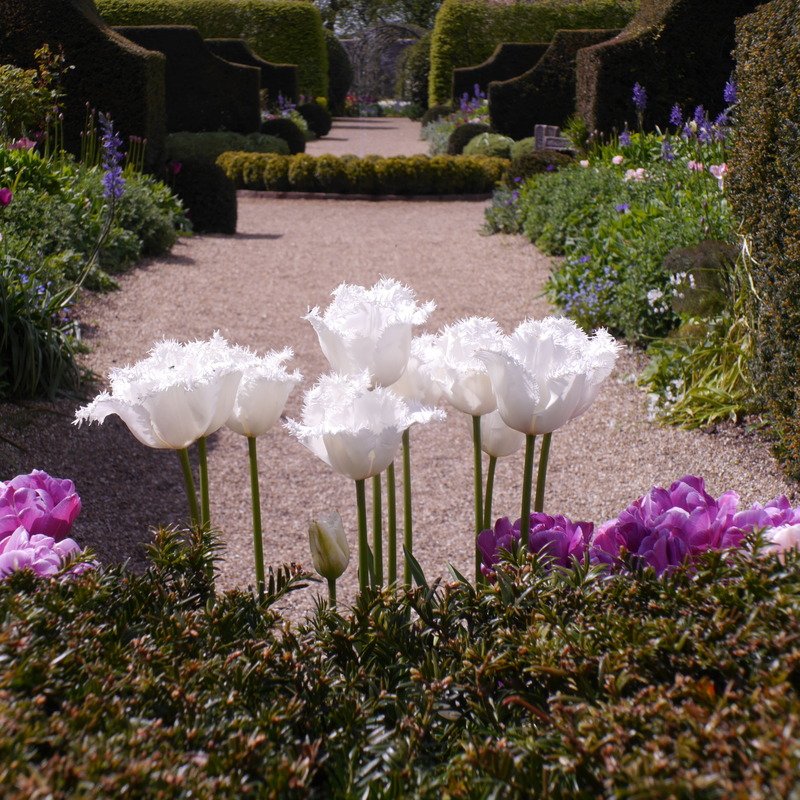 Especially the ‘Collector Earl’s Garden‘ (designed by Isobel and Julian Bannerman), an evocation of a formal Jacobean garden. Bold, dramatic, colourful and to my mind, very ‘Alice in Wonderland’ in its theatricality. 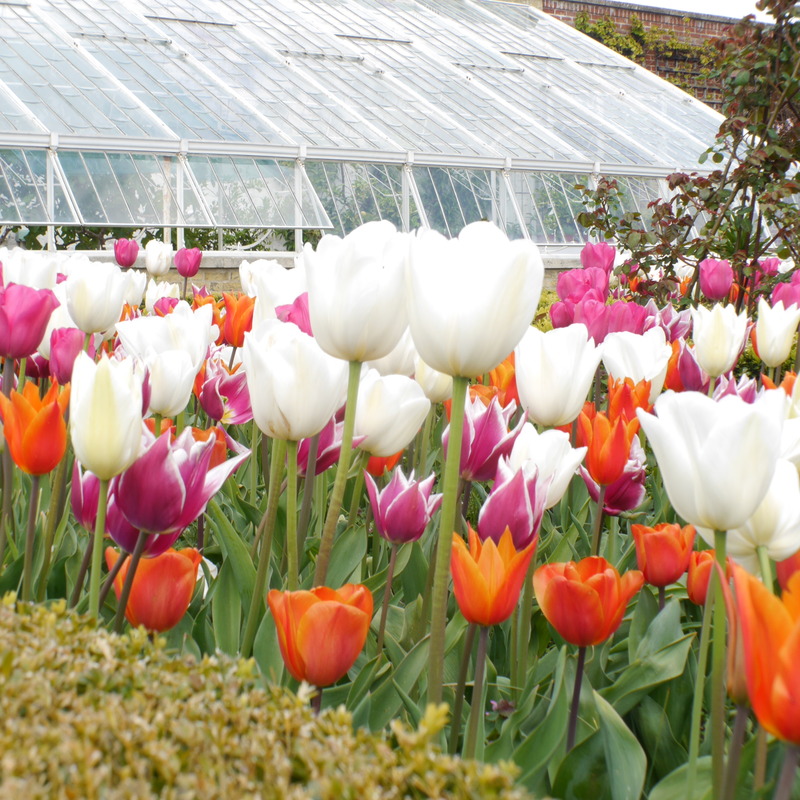 Enormous swathes of tulips, bolts of bright colours and a truly architectural feel to the space. The theatre is enhanced by the green oak folly ‘Oberon’s Palace’ and the quirky Fountain inside – a stalagmite rising from the ground with a golden coronet dancing upon the water jet. Mesmerising. (Click the link for video). 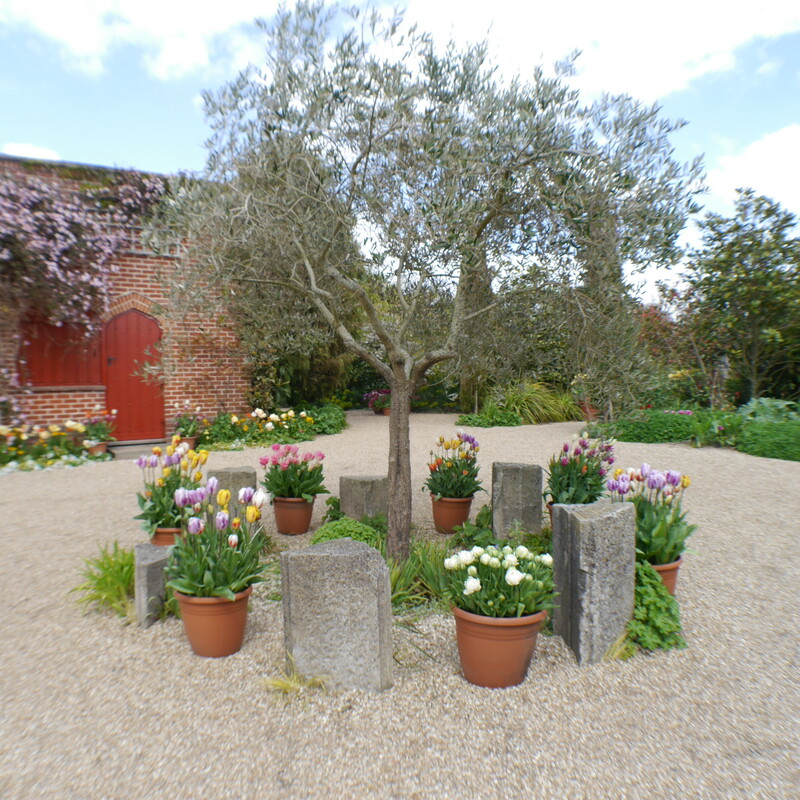 The newly planted rose garden, on the site of a medieval bowling green, was, by contrast, understated and calming and currently full of soft, pink tulips. And the white garden. Oh, the white garden! A small walled garden next to the Fitzalan family chapel. 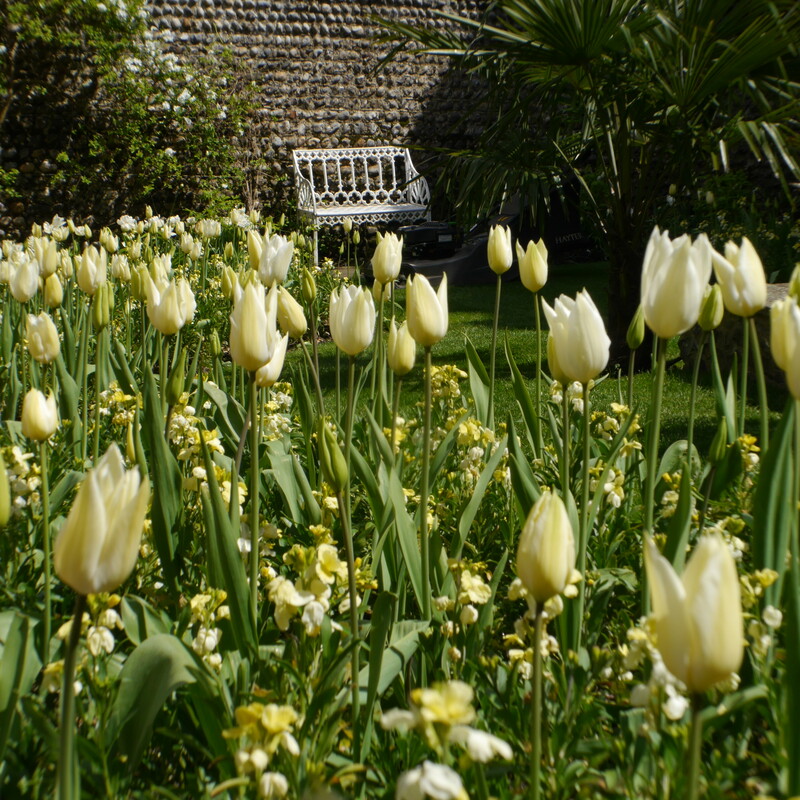 At this time of year luxuriant with white tulips and creamy wallflowers. The perfect place for peace and contemplation. And billing and cooing with a handsome prince. There is also an amazing stumpery: a wildlife haven with upturned tree stumps underplanted with woodland plants; cowslips, euphorbias, hellebores, primroses and bluebells. And an inspiring kitchen garden with fan-trained fruit trees and large beds full of thriving vegetables and companion flowers. And tulips. Tulips everywhere. As far as the eye can see. 32,000 of them, apparently. The Allium Extravaganza is next up. I shall definitely be returning for another fairytale fix soon. 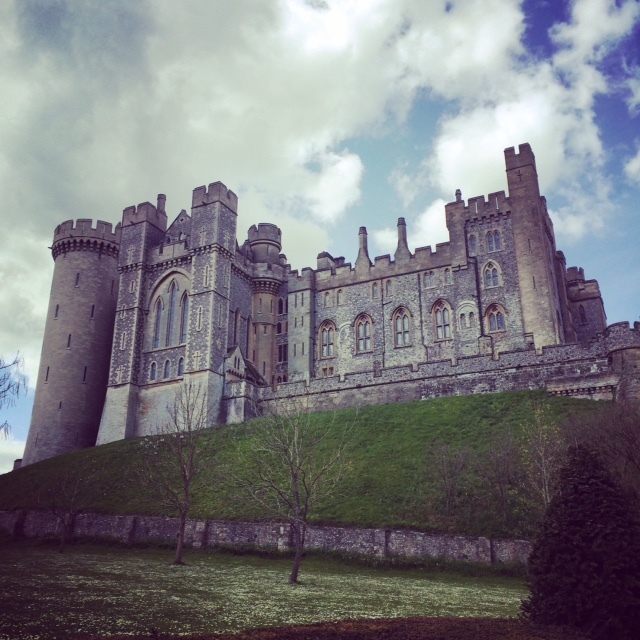 Arundel Castle is open daily from 10am. Garden only tickets are £9. Tickets for castle and gardens are £16. 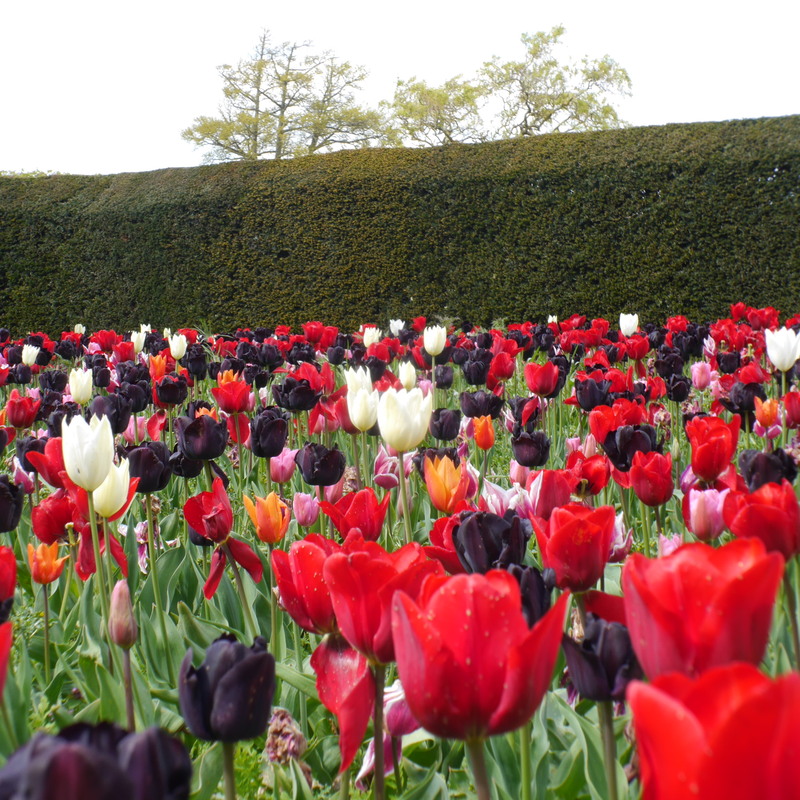 Arundel, castle, potager, Rapunzel, tulips. Bookmark. I know Arundel Beth…….our cousins lived at Worthing,nearby. I too love the old stories and Rapunzel comes to mind……..what a climb !!!! 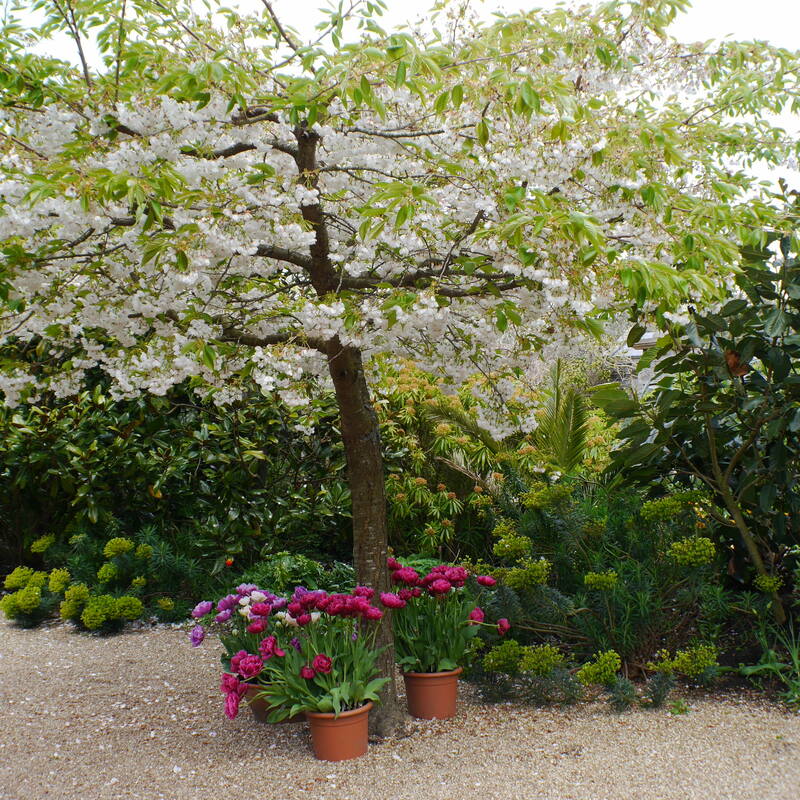 Beautiful garden…..thank you for sharing.